I love Texas for many reasons. I couldn't help but fall in love with the culture I experience here. Heat is part of Texas culture and I'm determined that tough summers build tough people. The scalding heat you feel when you walk out of your air conditioned car builds your possess. Walking outside to get your mail in the blazing sun affects your brain in a way that it increases your ability to live life better (away from the sun). This time of year I dearly miss North Carolina. The golden, crimson colors of the changing leaves made me feel like I was inside of a postcard. I'd drive my old, straight shift car in those curvy roads. I often didn't have destination. My goal was to get lost in the beauty of God's handwork. That my friends, is the best time to look at the changing leaves. When you move away from a place, it seems that the only thing you really take with you are those mental pictures. Hopefully, they are mostly happy. 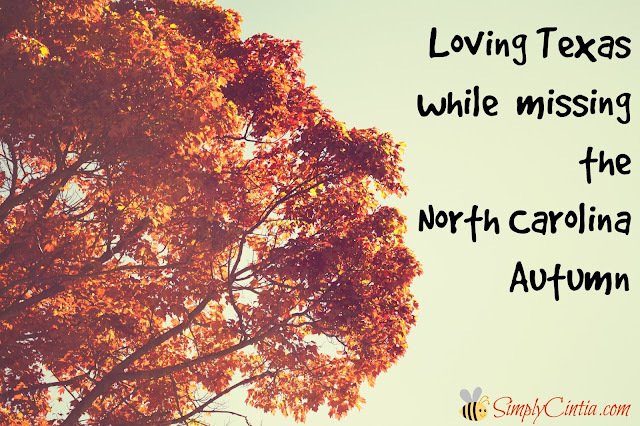 That's North Carolina in the Fall to me: beautiful mental pictures. I remember the leaves changing, the cooler air and the joy that this new season bring. The hope of Thanksgiving, the taste of holiday meals and the laughter with friends. Carolina in my Mind is the soundtrack of my Fall. I open my eyes and I am right back in the heat of Texas. I've given birth in the heat of this summer. No wonder my child is fierce. I've suffered the effects of heat and humidity, and it made me wiser and stronger. Still, I miss my Carolina Autumns. All I had to do was to look outside of my window where my older kids played and played in those golden leaves. I hope these memories will never fade away. For I am determined that this crazy love for Texas is here to stay. All while missing my North Carolina Autumn.